Thibaut Courtois said Diego Simeone criticises Real Madrid to boost his popularity among Atletico Madrid supporters as he hit out at his former boss. Simeone has come in for criticism after Ballon d'Or winner Luka Modric accused the Atletico head coach of having "a constant need to undermine Real Madrid". Atletico star Antoine Griezmann or Madrid centre-back Raphael Varane should have won the Ballon d'Or ahead of Modric, according to Simeone. 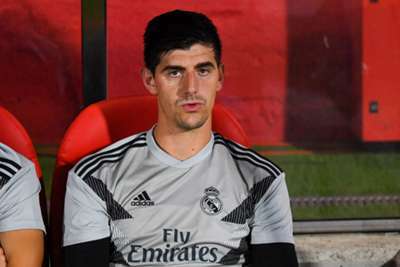 Earlier this month, Simeone also suggested Courtois only won the award for 'The Best' goalkeeper because he plays for Madrid and the Belgium international fired back following Saturday's 1-0 LaLiga victory over Rayo Vallecano. "Simeone criticises Madrid so as to be popular with his fans," Courtois said. "He always does it, attacks Madrid for being the best in the world." Courtois added: "Everyone's opinions have to be respected, everyone can say their personal opinion. "But I was there for three years and when you always fight against Real Madrid, which is the best team in the world, you're going to say things to generate populism. "In my case, he said I had won that trophy [Best goalkeeper] because I played for Real Madrid, but in the World Cup I was Chelsea, and in the The Best Award, the votes were closed in July. "[Atletico goalkeeper Jan] Oblak is also a great goalkeeper and could have had more points, but there are a lot of people who vote."